The Franklin Sports Electronic Pitching Machine is perfect to improve your child's batting skills! 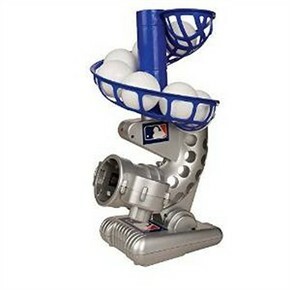 The kids pitching machine is great for young baseball players ages 5 and up to develop their batting skills and enhance their hand-eye coordination. The pitching machine throws out pitches every 7 seconds, with users being alerted by the red light indicator. The machine includes 6 balls and can hold 9 balls in its feeder. Height can be adjusted into 3 different positions. Requires 4 D batteries (not included). Availability: This Franklin Electronic Pitching Machine takes approximately 1 business day to leave the warehouse.